This is a little blog post describing my home network setup and the thoughts and principles behind it. I hope it may be of use to somebody having similar goals. … was to have separated VLANs / IP subnets for different purposes. But testing revealed this would break #6: there are so many IoT apps on mobiles which work only if the mobile is connected to the same IP subnet as the IoT device. But I wanted at least some control – especially how the devices are allowed to connect to the Internet, but without having to manage each device independently. So as a compromise I devided a /24 net into chunks of 32 IP addresses, this gives eight different “segments” which can talk without restrictions to other devices / to the other “segments” but have limited / controlled connectivity to the Internet. This was the basis for further plans. My NSM of choice became foxfound. The original repo can be found here, my derived here. There are still some issues to be fixed, see issues in the original and in my repo. 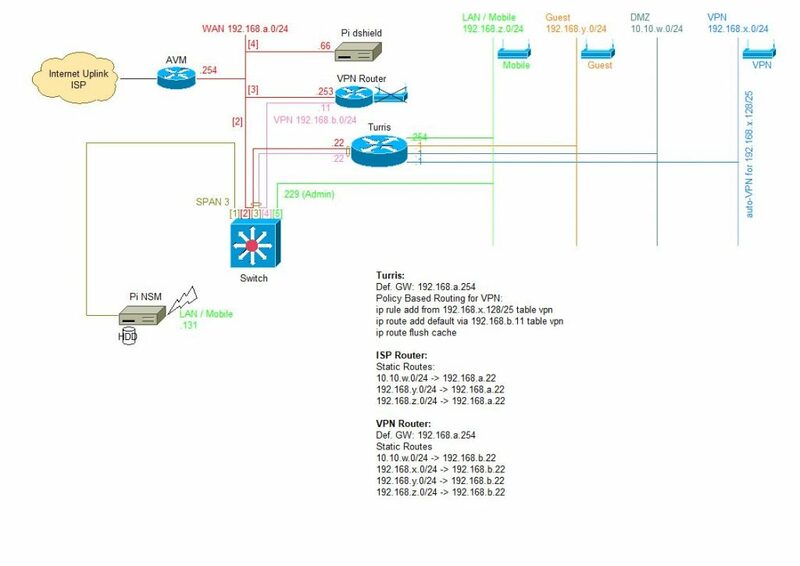 Where possible I use different IP subnets / VLANs to separate traffic. But the basic design decision for the main network had to be weakened, see above. If the device breaks or the ISP changes: a new device should be up and running without any hassle. A typical vendor for such hardware would be AVM, product being FRITZ!Box. To provide VPN functionality without breaking #1 and #3 I chose to get a separate device. After some reading and asking aunt Google my decision was this device: GL.iNet GL-MT300N-V2. It is small, cheap, configurable, understands OpenVPN profiles. One little drawback: LAN and WAN ports are not allowed to be on the same subnet. For details see above. The basic installaion is the official Raspberry Pi software from SANS ISC, which can be found here. This was easy, especial it one wants to support OpenSource hardware and software and need a flexible, powerful but affordable device: Turris Omnia. Copyright © 2018 Gebhard's Site - This work is licensed under a Creative Commons Attribution 4.0 International License (if not otherwise stated in the respective blog post).